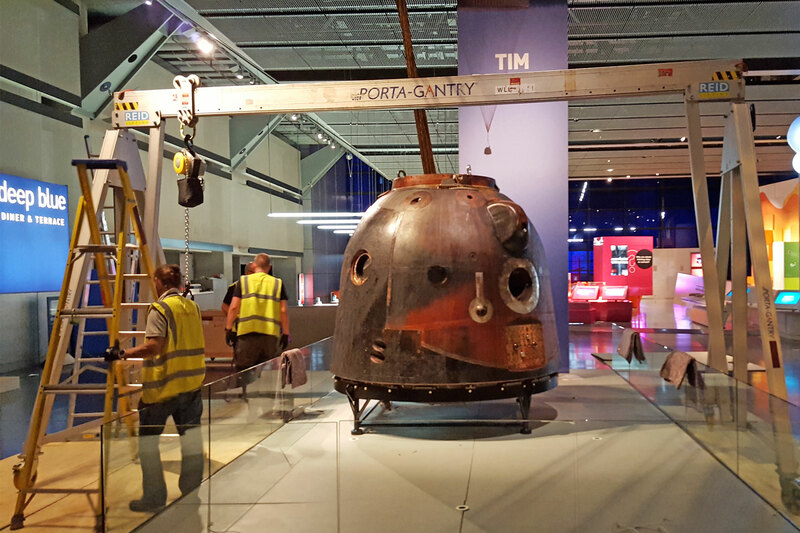 The Science Museum Group purchased the Soyuz space module. Martinspeed was contracted to arrange the definitive import from Russia and the delivery to the Science Museum as well as the installation at all venues. Of the UK tour. Transport and installation at ten UK venues of an item weighing 1650kg. Each venue in the tour required site visits to determine the most adequate means of transport and lifting for the installation. All venues required a site visit and Risk Assessments and Method Statements (RAMS) prior to operation. All venues required floor protection. Additional museum objects have been added to the tour which require climate control storage and transport. Gantry lift onto the plinth at Science Museum, London. We used a 20 tonne crane to lift the module over a barrier and directly into the museum through large doors. We made a special reinforced pallet to move the object during the whole tour. We lifted the module into place onto an exhibition plinth with a 3 tonne gantry with a 6m beam. Curtain-sider, 5T fork-lift, reinforced pallet with 4-way entry, and 3m pallet truck over ply spreader sheets at Museum of Science and Media, Bradford. We dismantled lifted the external barrier which allowed us to lift the module off the outside platform at the back of the Science Museum and onto a curtain sider vehicle with a 5T fork lift and to be strapped and secured. At Bradford we carried out the reverse operation with a 5T forklift and helped install the parachute with a cherry picker. Draping the spacecraft’s parachute at Museum of Science and Media, Bradford. This venue required the protection of an old railway turntable where the module was installed. Curtain-sider vehicle and fork-lifts were used. The Railway Museum presents the challenge of having road access limited by a low bridge of 370cm high. For the delivery to York we arranged for a low-loader vehicle to carry out the transport from Shildon to York. This gave 10cm clearance from the top of the protected module to the bridge. The 5 tonne fork-lift also needed to be delivered to York with a low-loader. Once in the museum compound, the installation was the same as previously, with gantry, long pallet truck and floor protection. Collection from York also required a low-loader due to the bridge access mentioned above. On arrival in Manchester we hade a 5T fork lift delivered for the immediate unloading, lifting onto a pre-built platform at an external alley-way door, and installation with gantry in the exhibition space. This venue required night-time delivery with a crane via the large doors in Chambers Street in Edinburgh. Installation followed the previous examples with gantry. Peterborough Cathedral has a threshold that is 5cm narrower than the object due to the protruding stone foundations. We offloaded the module with a 5T fork-lift and lifted it over the threshold with a gantry and 6m beam, before installing the module on the altar of the cathedral and assisting suspending the parachute from the inside of the dome. Delivery on a curtain-sider vehicle and offloading with a 5 tonne fork-lift.. The module does not fit through the museum doorway and will be moved over the door on a specially built platform. Installation at the museum with follow the previous method. Ferry transport of both vehicle to Belfast and same day install with gantry. The venue requires the fabrication of a special support for the gantry feet due to space restrictions and delicate floor (in progress).